This is the hard to find home that needs work at a very low price! Great opportunity for the right buyer to own a charming home with much of the original gingerbread and details still providing charm and character. Enclosed front porch has two access doors into two rooms as typical in this age of home. The home has natural woodwork and wood trim. Kitchen has a window bench. Upstairs has one bedrooms and a very large landing room used as another bedroom. Large 8X11 walk in closet and is the access to the walk in attic. A den is used as a bedroom on the first floor. Home has fencing on one side and property backs up to Lutheran Park. Fantastic oversized two car garage was built in 1996 and has a concrete floor and loads of built in shelves for nice storage. Home does not have utilities on and will not be on for any inspections. Home is being sold as is. Home has mold and discoloration and the steps to the basement are missing. Seller would consider seller financing terms that are subject to approval of management. Property taxes do not reflect any exemptions. 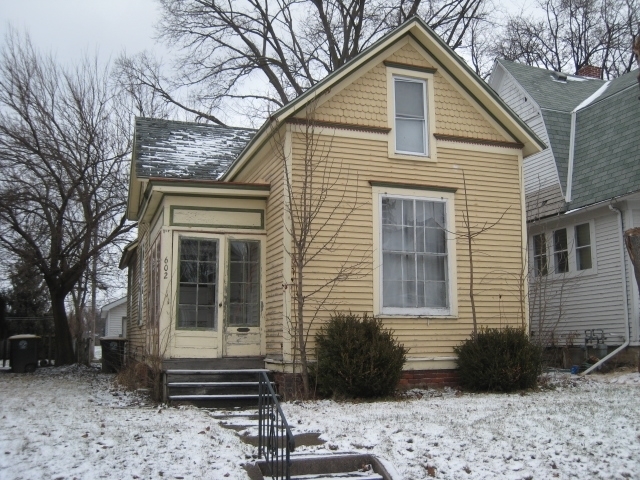 Located in and a part of South Wayne Historic Neighborhood Association. Directions:South Wayne to Kinnaird and turn east. Home on the left. Listing provided courtesy of Premier Inc., REALTORS.